Paramount Home Media will be teaming up with Nickelodeon on Mar. 7 for the DVD debut of PAW Patrol: Pups Save the Bunnies. Ryder and his four-legged canine friends — Chase, Skye, Marshall, Rocky … and more — are back for seven fun-filled adventures. 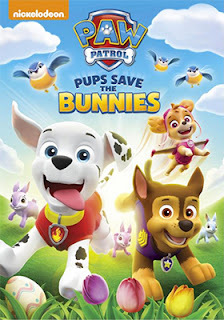 Spring is definitely in the air as the Paw Patrol helps out with the Easter egg hunt and they have to do their best to keep the peace between Farmer Yumi and a new crop of very hungry bunnies — no carrot is safe! And Foggy Bottom’s Mayor Humdinger is up to his old tricks with some stinky flowers and a plan to mess with Adventure Bay’s beloved Mayor Goodway’s spring tulips, so it’s the Paw Patrol to the rescue! And finally, two mysteries have to be solved — where have the song birds gone and who is letting Farmer Al's sheep loose! Warner Bros. Home Entertainment made it official this past week that director David Yates’ film adaptation of J.K. Rowling’s Fantastic Beasts and Where to Find Them will be available as a four-SKU home entertainment product offering on Mar. 28. The ARR for that date works out to 130 days and domestic ticket sales were an impressive $231.7 million. Planned for release are a 4K Ultra HD/Blu-ray Combo Pack edition, a Blu-ray/DVD Combo Pack, a double-Blu-ray SKU (which features a 3D viewing option) and a double-disc DVD edition. This new film franchise, starring Eddie Redmayne as Scamander — the future author of a renown Hogwarts’ text book of the subject of “Fantastic Beasts” — is a cousin of sorts to the Harry Potter franchise. With that built in audience — and a terrific story all on its own — Fantastic Beasts and Where to Find Them was an instant success at the box office. Two additional films are already in the works, with the next installment slated for delivery during the Thanksgiving period in November of 2018 (and there are rumors afloat that this newly-minted film franchise might be extend to a fourth and fifth entry). As to bonus goodies, there are eleven deleted scenes and a multi-part look at this new corner of the J.K. Rowling world of wizardry that is titled “Before Harry Potter: A New Era of Magic Begins!” Rowling is joined by director David Yates (he directed four of the Harry Potter films, plus The Legend of Tarzan last year) and David Heyman (Oscar-nominated producer of Gravity, plus the Harry Potter film series and such films as I Am Legend, We’re the Millers, etc.) as they cover the new characters, the creatures (aka: beasts) and a look at the film’s design in an 18 segment production overview. Also on the release calendar for delivery to retail on Mar. 28 are 4K Ultra HD editions of Harry Potter and the Order of the Phoenix, Harry Potter and the Half-Blood Prince, Harry Potter and the Deathly Hallows: Part I and Harry Potter and the Deathly Hallows: Part II. The Film Detective announced this past week that ten new film restorations that will be ready for the DVD market place on Jan. 31. In 1962 famed horror and sci-fi filmmaker of the 1950s, Bert I. Gordon, took a slightly different tack with the release of The Magic Sword. 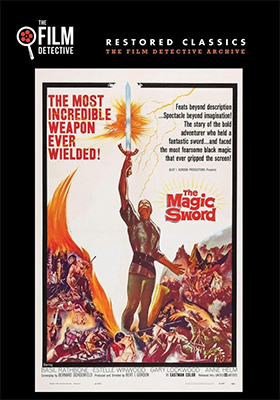 With the success of director Nathan Juran’s The Seventh Voyage of Sinbad in 1958 and the theatrical market on overload with sci-fi and horror films at the end the 50s and early 60s, Gordon turned his film-storytelling talents to this quest adventure. Gary Lockwood stars as the foster son of a sorceress named Sybil, whose mortal enemy is Lodac (played by Basil Rathbone) and he has kidnapped the Princess Helene (Anne Helm — Follow that Dream, The Interns, Honeymoon Hotel, etc.) and plans to feed her to his dragon! Our hero has a company of six companion knights (read that as the victim pool), a magic sword and only seven days to overcome seven curses to accomplish his task!! On the Western front, the Film Detective has director John McCarthy 1935 film adaptation of the William Colt MacDonald novel, Law of the 45’s, starring Guinn 'Big Boy' Williams as Tucson Two Gun Smith — his co-star is Molly O’Day — and also from 1935 is director Charles Barton’s film adaptation of Zane Grey’s novel, Fighting Westerner (aka: Rocky Mountain Mystery), teaming Randolph Scott with Charles 'Chic' Sale to solve a series of mysterious murders. 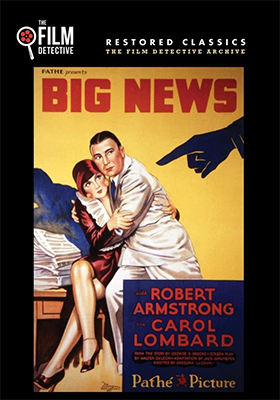 Included in the Jan. 31 release mix is the 1921 silent film from director Cecil B. DeMille, The Affairs of Anatole, starring Gloria Swanson and Wallace Reed and the early sound film, director Gregory La Cava film adaptation of George S. Brooks’ stage play, Big News, with Carole Lombard and pre-King Kong star Robert Armstrong. Rounding out the Jan. 31 film restorations are Easy Money (1936, with Onslow Stevens and Kay Linaker), Mad Youth (1940), Freckles Comes Home (1942, Johnny Downs, Gale Storm and Mantan Morland star), The Man Who Cheated Himself (1950, Lee J. Cobb with Jane Wyatt) and director Marvin Chomsky’s 1971 bio-pic Evel Knieval, starring George Hamilton as the legendary motorcycle stunt rider (Sue Lyon co-stars). 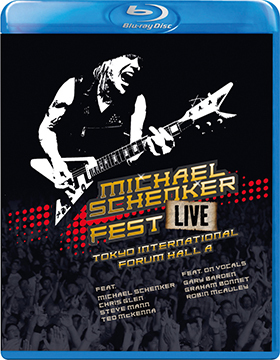 Inakustik, with domestic sales and distribution expertise provided by MVD Entertainment Group, will be serving up a three-SKU helping of Michael Schenker: Fest - Live Tokyo International Forum Hall on Friday, March 24. In the mix are both stand alone DVD and Blu-ray product selections, plus a DVD/2 CD Combo Pack (which is actually a pretty good deal in that the differential in the SRP is just three bucks for the CD bonus). During August of last year German rock guitarist Michael Schenker and MSG (aka: Michael Schenker Group) did a three concert set in Japan (with stops in Osaka, Tokyo and Sapporo over a four day period) and cameras were rolling at the Tokyo International Forum venue, which reunited Schenker with his 1980s MSG trio of singers Gary Barden, Graham Bonnet and Robin McAuley (their collective history with the band is a story all onto itself) for this two-and-half hour live concert. Included in the set are the likes of “Armed and Ready,” “Victim of Illusion,” “Cry for the Nations,” “Into the Arena,” “Let Sleeping Dogs Lie” and “Doctor Doctor” — all of which were performed live at the famed Budokan concert in Tokyo in 1982. Arrow Video, with domestic sales and distribution expertise provided by MVD Entertainment Group, has outlined its March 2017 line of new Blu-ray product offerings and there will be new film restorations heading to retailers on each of the four street-date Tuesdays during the month. Bookending the month’s selections are two film restorations arriving under the company’s “Arrow Academy” promotional banner — Luchino Visconti’s 1973 film release of Ludwig on Mar. 7 and on Mar. 28 look for Italian filmmaker Giuseppe Tornatore 1989 Best Foreign Language Oscar-winner, Cinema Paradiso. 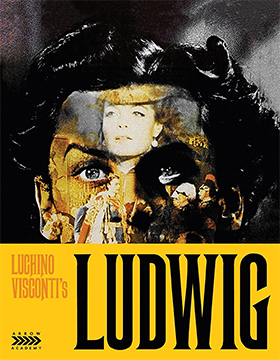 Ludwig II of Bavaria (aka: The Mad King of Bavaria) was the subject of Visconti’s epic 1973 film, Ludwig, starring Helmut Berger in the title role. 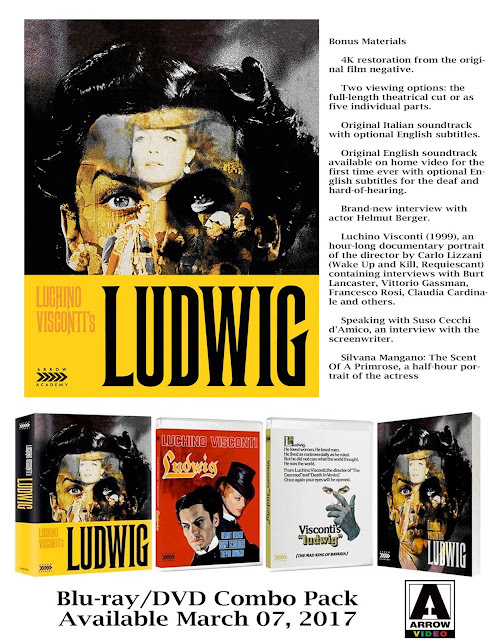 Arrow Video has completed a 4K restoration of the film from the original camera negative and is presenting it with two viewing options — the theatrical cut or in the form of a five-part mini-series presentation. There are two language track options, the original Italian (with optional English subtitles) and the English language track, which is available now for the first time. At the other end of the month — on Mar. 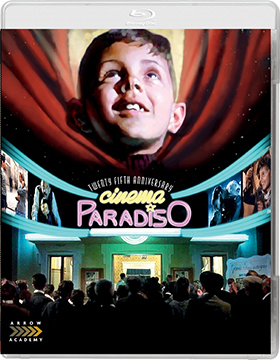 28 — is Cinema Paradiso, which is also being presented with two viewing options — the theatrical cut (124 minutes) and the Director’s Cut (logging in at 174 minutes) — both are presented in Italian with optional English subtitles. Also streeting on Mar. 28 are the 2K restorations — that restorations as in plural — of director Steve Miner’s 1985 surprise theatrical hit, House, and its 1987 sequel, House II: The Second Story (direction by Ethan Wiley). 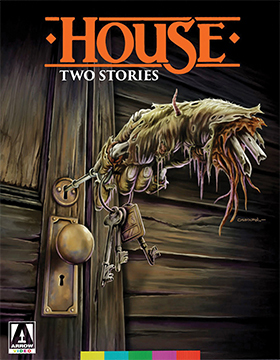 Arrow Video is promoting this double-disc Blu-ray presentation as House: Two Stories. Bonus nuggets for House include commentary by director Steve Miner, producer Sean S. Cunningham, screenwriter Ethan Wiley and actor William Katt and the making-of documentary titled Ding Dong, You’re Dead! : The Making of House. 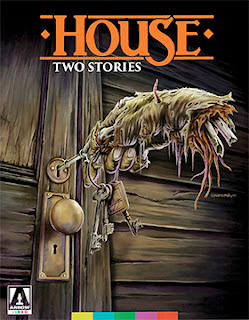 For House II: The Second Story, director Ethan Wiley and producer Sean S. Cunningham team for commentary and the newly prepared making-of documentary titled, It’s Getting Weirder! The Making of House II: The Second Story. Elsewhere on the March Blu-ray release calendar from Arrow Video are: Italian filmmaker Elio Petri’s 1973 film release of Property is No Longer Theft (a Blu-ray/DVD Combo Pack on Mar. 7) — a new 4K restoration from the original film negative and newly prepared video sessions with actor Flavio Bucci, producer Claudio Mancini and Make-up artist Pierantonio Mecacci — documentary filmmakers Tim Grabham and Jasper Sharp’s Creeping Garden (a Blu-ray/DVD Combo Pack with a bonus CD on Mar. 14) and Japanese filmmaker Takashi Miike’s Dead or Alive Trilogy (featuring Dead or Alive, Dead or Alive 2: Birds, Dead or Alive: Final as a double-disc set on Mar. 14). Ruthless Films, LLC, with sales and distribution support provided by MVD Entertainment Group, has tabbed Mar. 14 as the DVD debut date of director Evan Tramel’s latest CGI animated tale, Easter Bunny Adventure. When Marvin the Bull announces to the other farm animals that they need to have an Easter egg hunt things are set in motion. Set in motion BIG TIME!!! 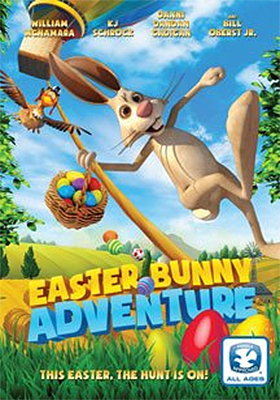 This Dove Family Approved story has Benny the Easter Bunny hopping into a hot air balloon — along with Wilma, the barnyard chicken — in an amazing journey to Fairy Tale Valley (where the inhabitants love to tell fairy tales) in search of a magical egg. 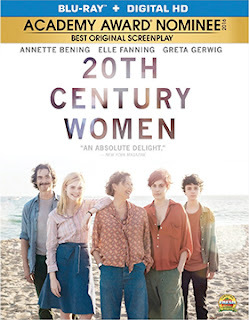 Lionsgate Home Entertainment was out this past week with news about DVD and Blu-ray editions of a couple of minor Oscar contenders. It was sort of a: “get these out of the way,” as the big one, filmmaker Damien Chazelle’s La La Land, which is still waiting in the wings, will be announced soon … more on that in a minute. 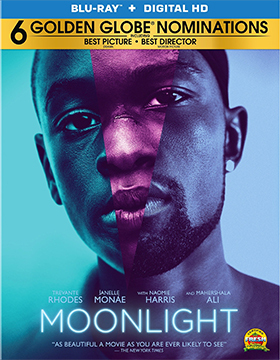 In the meantime, writer/director Barry Jenkins’ Moonlight, which is competing in the Best Picture category (along with Directing, Best Adapted Screenplay and five other nominations), will be available as both DVD and Blu-ray editions on Feb. 28. The ARR is 130 days and ticket sales are a tad on the lackluster side at $15.8 million (that number will improve with the Oscar buzz and could reach $20 million when all is said and done). The other film in the Oscar derby is writer/director Mike Mills’ 20th Century Women, which has Mills (Beginners, Thumbsucker) competing in the Best Original Screenplay category. Liongate has tabbed Mar. 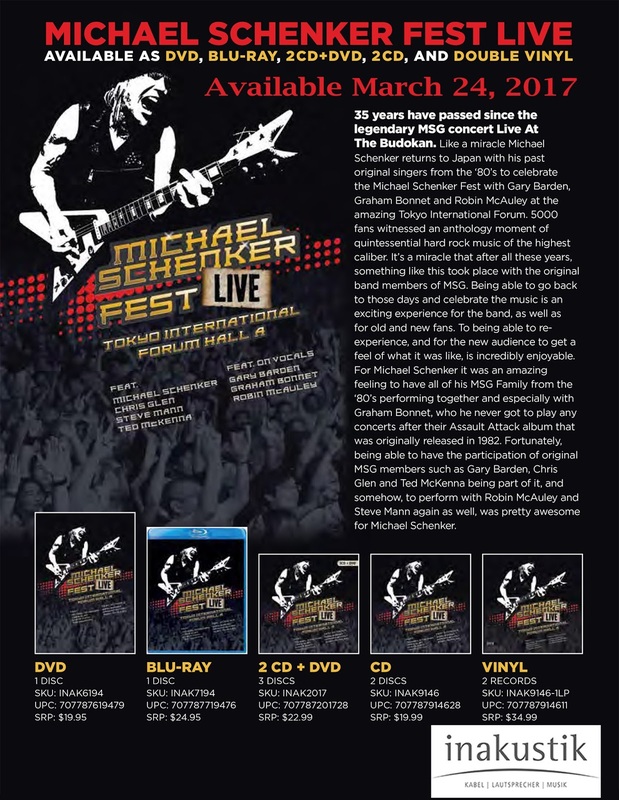 28 as the street date for both DVD and Blu-ray editions. The ARR is 88 days and ticket sales from the film’s platformed theatrical run currently stand right at $3 million. As to La La Land, it seems certain that either Mar. 14 or Mar. 21 will now be the likely street date for its home entertainment launch. Lionsgate would be wise to avoid both Walt Disney Studios Home Entertainment’s Moana on Mar. 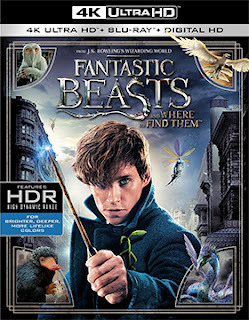 7 and Warner Bros. Home Entertaintment’s Fantastic Beasts and Where To Find Them on Mar. 28. With Hacksaw Ridge and Manchester by the Sea previously announced for delivery on Feb. 21, and Hell or High Water already out on DVD and Blu-ray, Lionsgate is sitting pretty with five of the nine films in the Best Picture category (although, technically-speaking, Manchester by the Sea is from Roadside Attractions and Moonlight is an A24 theatrical release). The Oscar telecast is on Feb. 26.